As medical technology increasingly gets more advanced and sophisticated, people are living longer lives and enjoying good health well into their twilight years. However, new technology does not mean medical malpractice does not occur. One danger especially associated with cosmetic surgery is the tendency for patients to forget that cosmetic surgery is still surgery, and brings the same level of risks for serious injury. South Florida, in particular, is known for having a lot of cosmetic surgery clinics due to the large demand in the area. Unfortunately, not all doctors holding themselves out as cosmetic surgeons have the necessary skills or training to safely perform these procedures. Two doctors practicing in South Florida were recently disciplined by the state medical board for failed liposuctions that led to serious complications for two patients. In addition to liposuction, breast implants are another popular procedure women undergo for cosmetic and reconstructive reasons. Because this procedure requires leaving a foreign object in the patient’s body, the risk for dangerous complications is higher due to either medical negligence by the doctor or a defective product from the manufacturer. Further, injuries to breast implants are also possible in many types of accidents. Consequently, a number of situations exist where a lawsuit may be in order due to a breast implant-related injury. The rupture of a silicone breast implant is a serious issue that requires medical attention. Silicone implants present greater concerns than saline implants due to the danger silicone can pose to the body if it enters the bloodstream. If a rupture of a silicone implant occurs, the existence of a legal claim depends on how the rupture happened. If a doctor incorrectly places the implant and it later ruptures or leaks, the doctor could be liable for medical malpractice. In addition to ruptures, negligent medical care could also lead to misshapen and/or hardened breast tissue, and infections around the incision sites. Medical malpractice attorneys should always be consulted as soon as an injury is discovered, because there is a time limit of four years to file a lawsuit that is measured from the date the injury-causing incident occurred. If the injury is discovered after that four-year window, the legal action is no longer viable, minus injuries to minors. Ruptures and leaks can also occur if the implants themselves are defective. In this circumstance, the manufacture could be legally responsible under product liability law. Manufacturers cannot produce items that present an unreasonable injury to the user. An implant that is susceptible to rupturing or leaking due to a design issue or improper assembly at the factory presents an unnecessary risk to the consumer, and is likely to leave the manufacturer responsible if a woman later suffers an injury because the implant was defective. Unlike medical malpractice claims, the time limit to file the lawsuit does not start running until the injury is discovered, so the window to obtain compensation is not as restrictive. Finally, if an implant is damaged and ruptures due to an accident caused by someone else’s negligence, a personal injury lawsuit may be a possible step, once medical treatment is received. The law imposes a legal responsibility for injuries caused by negligent and intentional acts, including later injuries that happened as a result of an initial negligent act. The wife of San Diego’s former mayor, Ralph Hedgecock, filed a lawsuit against the city for breast implant-related injuries. The lawsuit alleges the city failed to repair a sidewalk, which caused his wife to trip and fall. She claims the implants were ruptured in the accident, causing silicone to leak into her bloodstream. 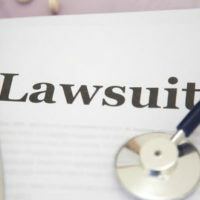 Any type of medical-related injury is scary for the victim, and should be immediately addressed medically and legally. A personal injury attorney can advise you on the viability of a legal claim, and the best way to proceed if someone is liable. The Miami law firm of Pita Weber Del Prado has extensive experience handling complex medical injury cases, and can help you pursue compensation for your injury. Contact the office for a free consultation.